This lease form is extremely pro-tenant in orientation. It contains zoning warranties by the landlord for the premises, a right of first refusal, a purchase option for the tenant, a radius clause prohibiting competing restaurants, and a tenant only right of termination. 2. LEASE TERM: Tenant shall have and hold the demised premises for a term commencing on the date of last execution hereof and ending twenty (20) years from the date upon which the ______________________ Restaurant hereinafter referred to is opened for business to the public. 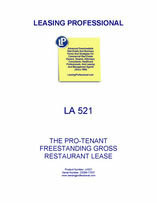 When the term is ascertainable and specifically fixed, or otherwise agreed to by Landlord and Tenant, Landlord and Tenant shall enter into a supplement, suitable for recording, which shall specify the actual date for the expiration of the original term of this Lease and for the commencement of accrual of rent payable hereunder by Tenant. A. ZONING APPROVALS: That Landlord shall, if necessary, use its best efforts to obtain the approval of all public or governmental authorities as to all matters relating to zoning, subdivision, lot splits, special use permits or similar requirements for use of the demised premises as a ______________________ Restaurant in accordance with Tenant’s plans and specifications, as will permit the Tenant to obtain all necessary permits, licenses and approvals referred to in Article six (6); and that Landlord shall pay and bear all costs for any off-site improvements and dedicate any easements required by any public authority as a condition to the granting of any approval or permit. B. UTILITIES: That water lines and gas mains, electric power lines, sanitary and storm sewers are located on the demised premises and are available and adequate for Tenant’s intended use; or, if the sane are not available and adequate, Landlord agrees to install utilities meeting Tenants specifications to the demised premises within thirty (30) days from the date Tenant notifies Landlord that all necessary permits and approvals have been obtained and Tenant delivers its plans and specifi­cations therefor. C. ENCROACHMENTS, ETC: That Landlord shall demolish and remove all encroachments, signs and underground storage tanks, if any, located on the demised premises. D. POSSESSION: That the demised premises are free and clear of all tenancies, whether oral or written, and that Tenant shall have sole and actual possession of the premises on ___________. E. TAXES: That Landlord shall pay, bear, and discharge all future real estate taxes and special assessments charged or imposed upon the demised premises or any improvements erected thereon by Tenant, or anyone claiming by, through, or under it. or upon the owner or occupier in respect thereof during the term of this lease or any extension thereof and to deliver promptly to Tenant at all times proper and sufficient receipts and other evidence of the payment and discharge of the same. F. COVENANT OF TITLE AND QUIET ENJOYMENT: That Landlord has good title to the building and leased premises free and clear of all liens, encumbrances, tenancies and restrictions. Landlord warrants and will defend the title thereto, and will indemnify Tenant against any damage and expense which Tenant may suffer by reason of any lien, encum­brance, restriction or defect in the title or description herein of the premises. If, at any time, Landlord’s title or right to receive rent hereunder is disputed, or there is a change of ownership of Landlord’s estate by act of the parties or operation of law, Tenant may withhold rent thereafter accruing until Tenant is furnished proof satisfactory to it as to the party entitled thereto. Landlord shall provide Tenant with any and all non-disturbance agreements, in form acceptable to Tenant, from any underlying landlord or holder of an encumbrance. G. COVENANT NOT TO COMPETE: That, during the term hereof, Landlord shall not, except with the written consent of Tenant first had and obtained, directly or indirectly engage in, or acquire any financial or beneficial interest in, or grant a lease to any persons to engage in a restaurant of any type in which food and beverages are dispensed within a radius of one (1) mile from the premises covered by this Lease. The foregoing restrictions and limitations shall, if Landlord is a corporation, apply to all activities of officers, directors, subsidiaries and affiliates of Landlord. Upon Tenant’s request Landlord agrees to execute and have recorded any necessary document Tenant may prepare to effectuate the foregoing covenant. H. PLANS: That Landlord shall provide to the Tenant mechanical (electrical, HVAC, plumbing) and architectural plans and specifications together with any other plans originally submitted to governmental agencies for the permits required to complete the building of which the demised premises forms a part, including the final site plan and survey. I. BUILDING CODE VIOLATIONS: That the demised premises currently meet all existing building and health code requirements and that there are no notices of violations pending. J. STRUCTURAL REPAIRS: That Landlord shall maintain and keep in good order and repair the foundation, slab, exterior walls, steel frames, roof structural portion and under­ground utility lines of the demised premises, except for damage caused by fire or other casualty or the intentional or negligent acts of the Tenant. Landlord hereby acknowledges that Tenant is relying upon such covenants, representations and warranties in executing this Lease and that matters so represented and warranted are material ones. Landlord, accordingly, agrees that any breach of warranty or misrepresentation shall be grounds for Tenant to elect, at its option, to terminate this lease or cure Landlord’s default(s) and deduct its costs to cure such defaults from rent thereafter accruing. These remedies are in addition to all other remedies Tenant may have in law or equity.